Now that I've been gone about 3 weeks, I'm getting the hang of using the various Internet cafes and access points to keep my blog updated. Internet access in French Polynesia and New Zealand has been ubiquitous – every place I've stayed either had it, or had it within a short walk. The question is really how much you want to pay for it. The more remote the location, or the less touristy, the more it will likely cost you (and the slower the connection is likely to be). Since I didn't bring a laptop, I'm subject to my lack of discipline. At any rate, time is money, and in New Zealand, I'm probably paying about $3/hour on average, whether in large Auckland, capital Wellington, or southerly Franz Joseph Glacier. Some computers are coin-operated, some are based on buying time via a communications company (like “Global Gossip” where you get a unique PIN #), and some are old fashioned timers on a computer (my preferred method). The views vary from dark and dreary to my favorite so far – the driver's seat of a converted bus facing Franz Joseph Glacier (the clouds are literally parting now so I can see a giant glacier on top of a mountain while it's like 70 degrees out and we're surrounded by rainforest – simply stunning). Most computers have 1-2 USB ports available in the front, which I stick my 1gb flash memory card into so I can ensure secure access to my accounts, and make use of my customized Firefox browser (makes Internet time more efficient). The other port is handy for using a card reader to upload my photos to Flickr. I need to get better about uploading fewer photos, and shorter videos, as the time seems to drag on, though I'm usually multi-tasking. Skype is pre-loaded on most computers and has been a breeze to use. I put $10 on it so I could call my parents on their home phone. Just 2 cents a minute. Brilliant! That's about all I can think of for now – please leave a comment if you have any questions. You’re missing a variable in the cost factor – ubiquity of personal computers. When you get into poorer countries where internet cafes primarily cater to local people, they get really cheap. 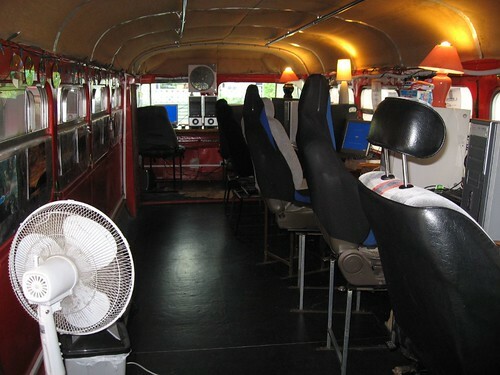 Super cool internet bus! Woot! Way cool net cafe, Dave! I honestly can’t believe you’ve been gone 3 weeks already. It’s weird – 3 weeks doesn’t feel like much time, yet each day feels really long and full. I hear Australia will be super hot, more expensive than New Zealand, with dirtier and bigger hostels, and lots of drunk English people. Not a pleasant picture! Good posts makes me think of beaches and well ill stop right there before i go x rated :mrgreen: I’m having such a good time reading your posts the food looks awesome even the duck noodles, the bus idea is 1 in a million man some great memories your making!!!! I’m glad I found your blog and am enjoying your travel reports. I’m hoping to do a similar ’round the world trip – if I can just sell my house in this horrible market. Your pre-trip posts have been very insightful. Keep up the good work and enjoy your travels!! 3 weeks… my how time flies!